Advocating for people in times of trouble, our team at Gump & Faiella handles personal injury and family law cases. Based in Moberly, Missouri, our law office has recovered more than $250 million in matters such as car and trucking accidents. In family law disputes, we protect the rights of our clients as they navigate divorce, child custody and paternity. Knowledgeable: We combine decades of experience. Compassionate: Our clients' needs come first. Driven: We pursue every avenue in order to reach the best possible outcome. This blend of client-focused practice and proven results is why our attorneys have earned widespread recognition throughout the legal community. We hold honors such as an Avvo "Superb" rating, and AV Preeminent* peer-review ratings, the highest rating, through Martindale-Hubbell. Our attorneys have more than 90 years of experience combined. We understand that when trying to recover from an injury or hold a family together in the midst of difficulty, the legal system is likely the last thing someone wants to deal with. Clients of ours can rest easy knowing that we take the burden off of them so they can focus on what really matters. 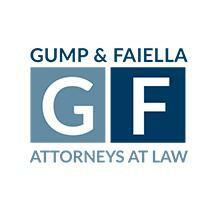 Gump & Faiella also takes cases that involve insurance claims and business litigation. Our law office provides free initial consultations and accepts credit cards.